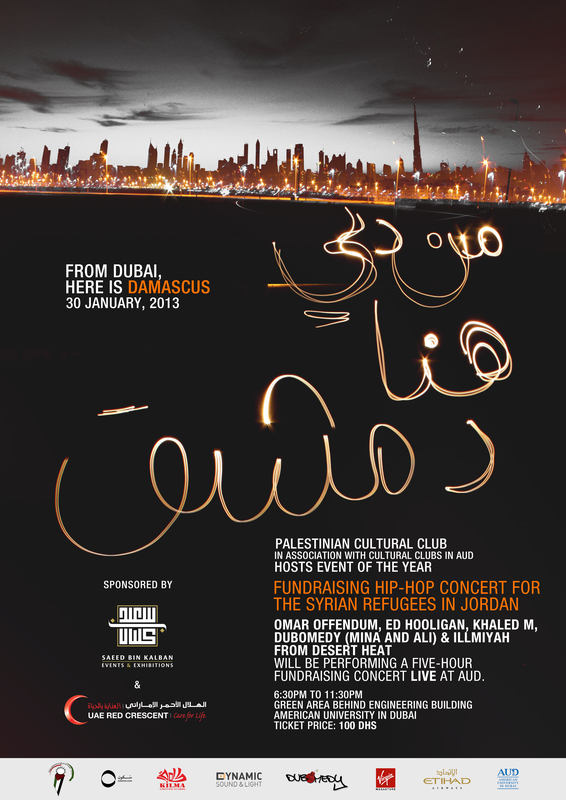 The American University in Dubai’ s Palestinian & Libyan Cultural Clubs in association with the UAE Red Crescent and Islamic affairs are proud to present to you ‘’From Dubai, Here is Damascus’’, a benefit Hip-Hop concert for the Syrian refugees on the Jordanian borders. The line-up for the show are Hip-Hop artists Omar Offendum, Illmiyah of Desert Heat, Ed Hooligan, Khaled M, Tiny , and others, with comedians Mina Liccione and Ali Al Sayed who will MC. Come help raise some much needed funds for the Syrian refugees and enjoy a show of Hip-Hop, Rap, and Comedy. All proceedings are to go to the Syrian refugees through the UAE Red Crescent; other donations such as clothes, blankets, and canned foods are more than welcome. When & Where: January 30th 2013, American University in Dubai, behind Engineering Building. Time: Doors open at 7:30pm.